Lemur Targets are message routers. They allow you to route groups of commands together so that they can share the same MIDI connection. You can think of them exactly like audio mix buses– except for MIDI. What’s great about Targets is that they allow you to separate out the different functions of your controller and send them to different MIDI connections. You can even swap around your MIDI connections without losing your group. Targets have connections for both input and output, but you don’t have to use both! Sometimes you don’t need to receive any messages. 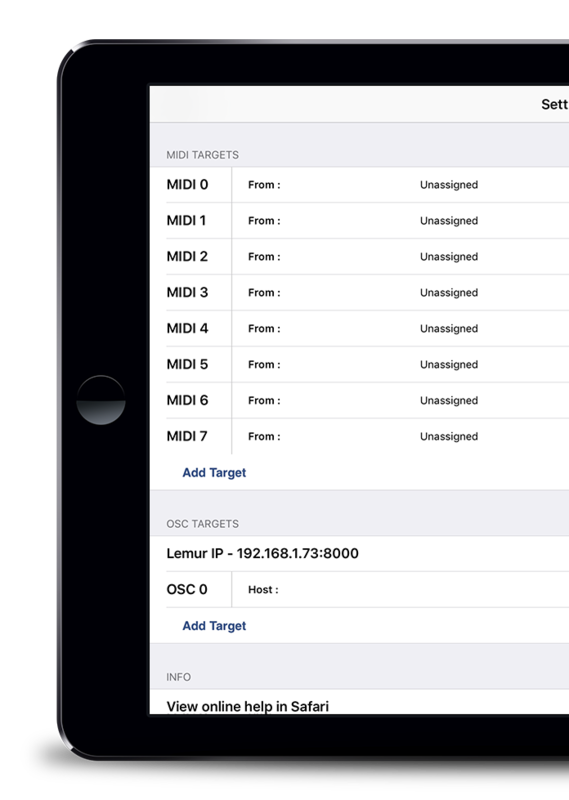 Lemur has 8 Targets, numbered from 0-7. To see how they are connected, tap the cog wheel at the top right of Lemur. Connections in the From column are inputs. Your tablet receives MIDI from these connections. Connections in the To column are outputs. Your tablet sends MIDI to these connections. If you wanted to connect all 8 Targets you would need 16 available MIDI ports– 8 out and 8 in! Obviously you can’t connect 16 MIDI cables to your tablet, that’s why most people use virtual WiFi MIDI ports. They act like invisible cables to your computer. Lemur on the Mac comes with 16 free Wifi ports. On the PC, almost everybody buys LoopBE30 (a free version is available). 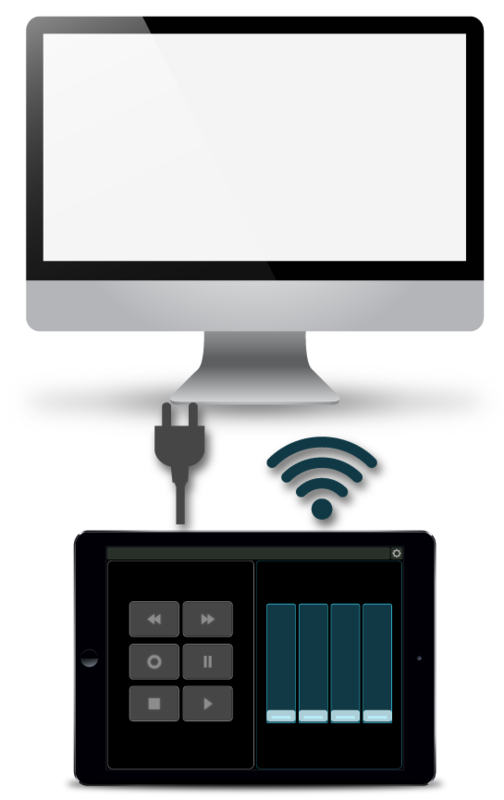 There are also amazing USB/Lightning hardware solutions like the iConnectMIDI that not only provide 16 MIDI ports through a single connection, but can even connect multiple tablets and have them talk to each other! Because the connection is faster, most people put their high performance controls on hardware connections. They also don’t suffer WiFi interruptions. WiFi has come a long way though, offering very comparable performance and high reliability. For most people there is no difference, and WiFi offers tremendous convenience. to change the Target routing. 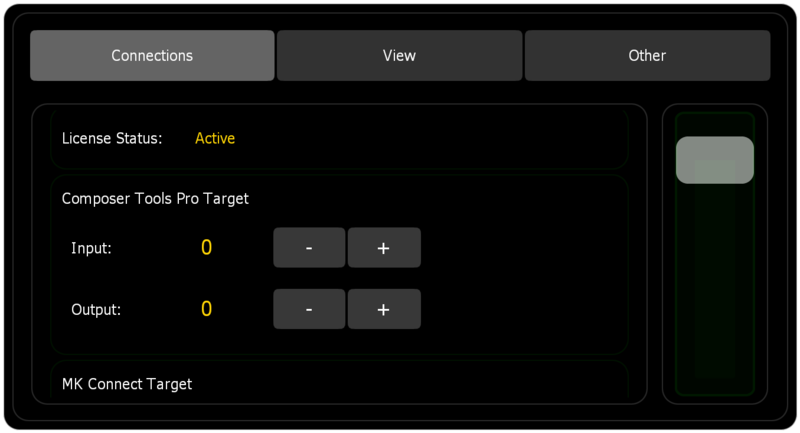 Here in Composer Tools Pro, the main controls have been routed to Target 0. Now it’s up to you how you want to make the MIDI connection! 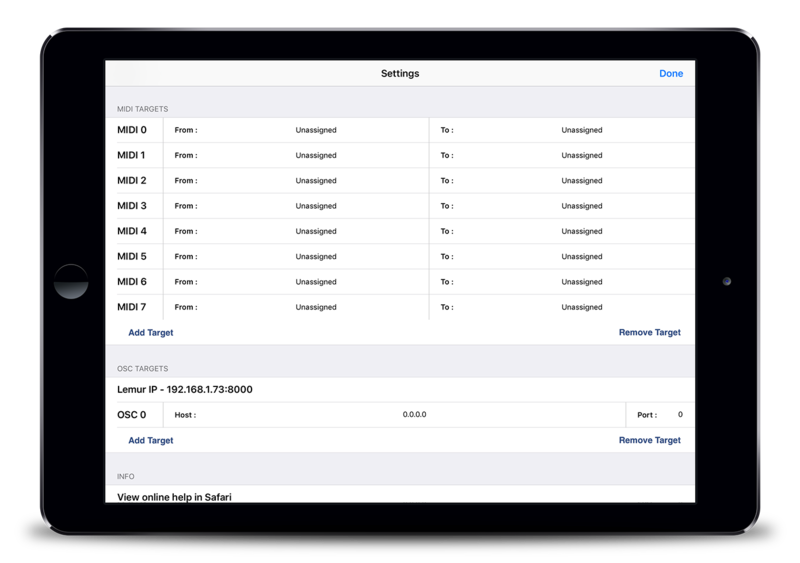 For more information on Lemur Targets, please see the Lemur User Guide. In your studio you might have many different ways to connect MIDI devices– WiFi, iConnectMIDI, a direct USB connection, etc. Obviously MIDI Kinetics can’t know exactly how you will connect your tablet, so we can’t hard-code a bunch of objects to a physical device. That would be like having a microphone permanently attached to your audio interface! 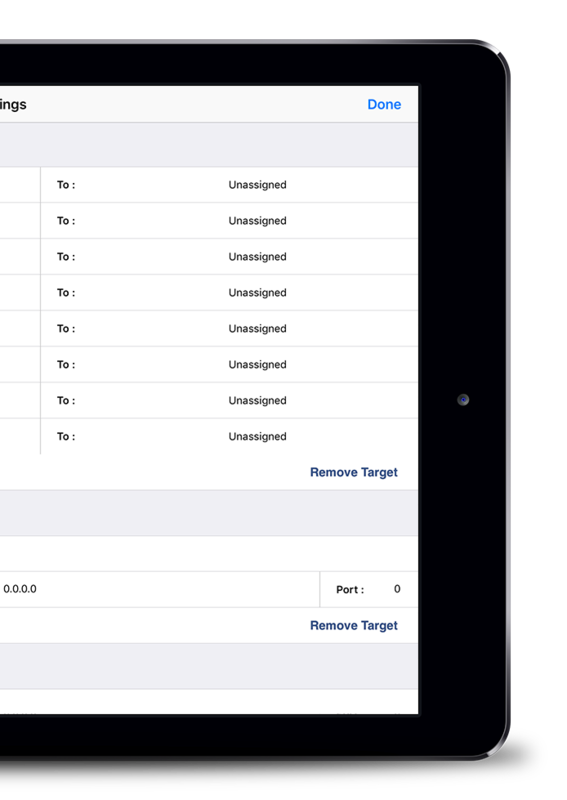 Instead, we can group functionality onto a target and say “These functions go out target #2”. Now it’s up to you how you want to connect this target to your studio. This is exactly how audio mix buses work. 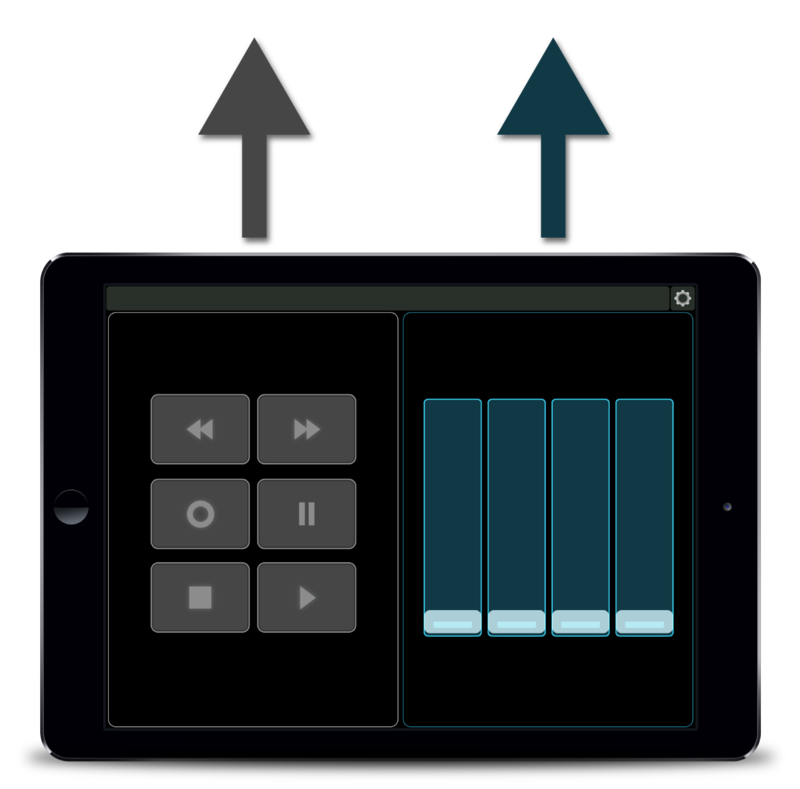 Mix buses control the flow of audio signals inside your DAW, while targets control the flow of MIDI inside Lemur*. A mix bus might eventually go out your main speakers or even to another mix bus, but they all get funneled together in a single group. * Well, that’s not exactly true. Mix buses can send audio to other mix buses, but targets can only send MIDI to the outside world.